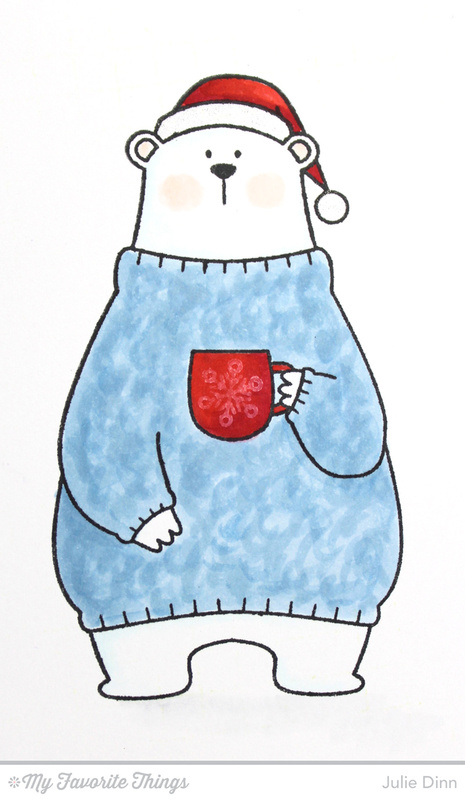 I have a sweet and simple holiday card to share with you today. This one features the adorable Cool Day stamp set and the Snowfall Background. I stamped the bear on a piece of X-Press It card stock and I coloured him with Copics. I tried to make his sweater look fuzzy and warm. I stamped the background with the fabulous Snowfall Background. To create the layout, I paired the Blueprints 14 Die-namics with the Vertical Stitched Strips. For the inside of the card, I followed the same basic layout as the front of the card. I'll be back later tonight with day 4 of the December new release countdown! I love this card, the bear is so cute. Thanks for sharing something a little different with us today.